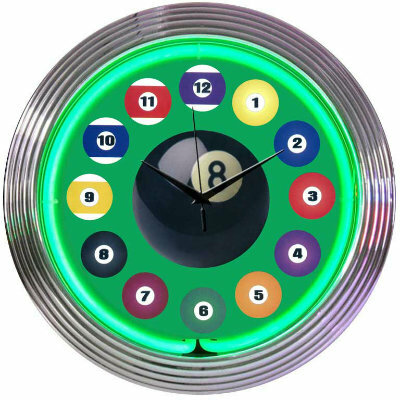 Time to rack 'em up and display this Billiards Neon Clock in your favorite hang out or pool room. A Billiards Neon Clock is an ideal decor piece for your billiards room, game room, man cave, bar or bar area or other desired room. This pool room neon wall clock displays a selection of pool balls, cues and a rack. Ideal for anniversaries, birthdays, Christmas, holidays, retirement or other special occasion.